Distressed Debt Investing: Does the Rising Tide of Primary Credit Markets Lift All Boats? Does the Rising Tide of Primary Credit Markets Lift All Boats? If you were relegated to one news item daily, and that news item was the strength of the high yield and leveraged loan primary market, you'd think the world was awash in bullishness and optimism. You'd think: "This economy must be trucking along" or "Job growth must be just spectacular" or "Every stock must be hitting 52 week highs." Then someone hands you a few Wall Street journals from the past week and you think to yourself, "Well: Europe is a complete disaster, economic growth is mediocre at best, China is a black box that on the surface seems to be slowing down. Maybe things aren't as good as the primary market suggests." High yield just reported its 8th consecutive weekly inflow. While this week was the lightest inflow for some time, it still came in at a robust $402M. Including funds that only report monthly, the last 8 weeks have seen $10B of high yield inflows. Year to date, inflows to high yield bond funds were over $27B versus a ~$15.5B for all of 2011. High yield is up 8.7% this year (CSFB) and retail is chasing the returns. These inflow numbers, combined with very light dealer positioning (=relatively illiquid markets), and a search for yield has catapulted most primary high yield and leveraged loan deals to be oversubscribed. Food fights and poor allocations have abound As an example, demand for the Patriot Coal DIP is quite robust with spreads being tightened 25 bps and OID going from 98 to 98.5. I emphasize most in the previous paragraph as certain deals have struggled (and probably rightly so). The Supervalu term loan added 50 bps of spread and 2 points of OID to get done. Granted this was a covenant lite loan backed by marginal grocery stores, but the deal still got done. A few deals that got hung or shelved months ago are coming back to the market with revised terms and pricing. And you guessed it: Dividend deals are coming back. Pilot, West Corp, Genpact, Dunkin' Brands (dividend or share buy backs), Red Prairie, and CHI Overhead just to name a few. The primary CLO market has been robust this year and arrangers are feeding the beast as it were. The bullish argument for high yield is well understood: Corporate balance sheets are solid, high yield really grinds it out in muddle through economies, U.S. high yield issuers are generally heavily levered to the local U.S. economy which removes any Europe taint, etc. That is all well and good. But who gets excited about a steel distributor inside 6.5% unless someone that has too much 1) cash to put to work 2) time on their hands. SVU/Albertsons/American Stores: American Stores, in theory, has a double dip because of the guarantee at SVU. I've attempted to build a waterfall here and nearly blacked out as the pensions can reach into every box, the lease rejection claims could be ahead of bonds, intercompany loans could or could not exist, etc. And those are just the on-the run names. There's a long list of illiquids too I'm keeping close to the vest. (Editor Side Note: You will note I didn't mention Knight Capital Group. I have doing work on Knight. I got greedy (stingy) on the converts and didn't pick up any and hate myself for not chasing. My plan was to by the converts and hedge by buying near term 2.5 puts. Would have worked out nicely. This situation resolves itself fast as Knight will have to deliver security (read: losses) in T+3 from yesterday. I admire whoever was buying the converts in the 50s. I have chosen not to do a post yet on KCG as the ability to hedge is somewhat limited right now and the uncertainty over a white knight / full sale versus a bankruptcy followed by a sale / split of businesses is pretty opaque. I wish I had a few billion dollars of capital sitting around to provide a rescue package here. 'Rescuers' that come to mind: Leucadia, Citadel (though they shuttered / sold their bond broker business last year), Jefferies, Aquiline Holdings (Jeff Greenberg's private equity shop) - the list goes on and on. This is real business - the question we need to ask: "Is this a permanent problem, or a temporary on?." I think its a little of both, but with the right buyer here, the reputational risks fall by the way side and you are left with a company with fantastic businesses that earn over $100M a year that, at $2/share is trading for ~$200M market cap. If you are looking at it and want to chat, please send me an email. Here is the org chart, devised from Exhibit 21.1 in the most recent 10K. 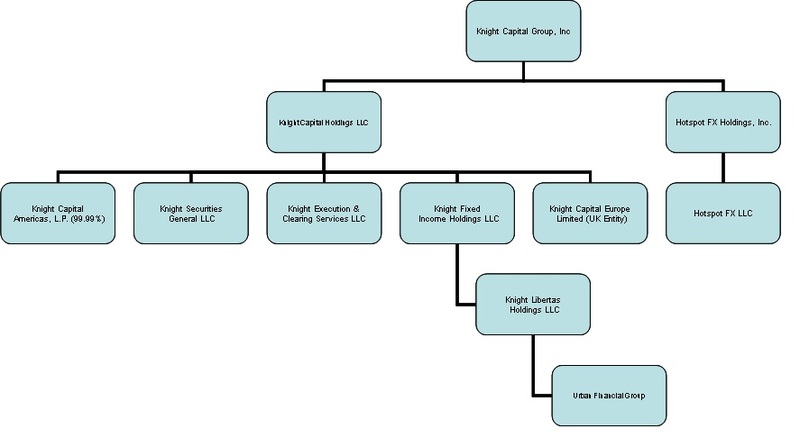 In the above chart, Knight Execution and Clearing Services LLC and Knight Capital Americas, L.P. are the domestic broker dealers. 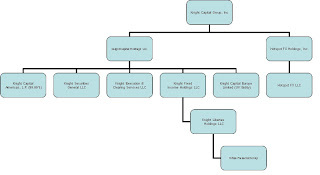 Knight Capital Europe Limited is also a registered foreign broker dealer. Focus on investment opportunities with a margin of safety, an asymmetric risk return profiles, and a hard, identifiable catalyst. Preferably where there is forced selling involved. Raise cash in assets that are getting closer to fully valued. Historically selling has been the weakness of many great investors. Do you sell at 90% of IV or 80% or even 100+% ... I'd be less worried about getting every bit of juice out of particular investment in this type of environment. These are interesting times to be a credit / distressed investor. Huge bifurcation between a plentiful secondary opportunity set that needs investigating and the painfully robust primary market that probably needs avoiding. Of course without a robust primary market, distressed wouldn't exist - bankruptcies are born in these types of markets; just we do not know it at the time. At some point though down the line investors will ask themselves: "Did I really underwrite a dividend deal for this pig? What was I thinking?" "Markets are increasingly distorted by central banks’ attempts to squeeze drops of growth from an over-indebted private sector across much of the developed world. These distortions stem from the central banks’ bias toward large-scale bond purchases along with super-low official interest rates, the demand for safe assets in a world still brimming with debt, and the discrediting of equities. It is increasingly apparent to market operators that these central bank-induced distortions are closer to reaching the end of their natural usefulness. Quantitative easing and its European cousin — long-term refinancing operations — have been useful and credible as a means of providing liquidity to markets and addressing systemic tail risk, at least temporarily. But as a way to boost growth from sub-trend to above-trend rates, and thereby facilitate deleveraging, such monetary policies have proven woefully inadequate, due to the politics around mounting public debt. In the U.S., a caustic political environment and an anti-business administration worry businesses and consumers as to how government is going to exit its fiscal stimulus policies in a coordinated and nonthreatening manner; whereas in Europe, a punitive fiscal retrenchment mandated by core countries has not yielded the weaker currency and the lower peripheral interest rates prescribed by a normal macro model. Markets have learned and, of course like junkies, now demand more frequent monetary hits in greater size"
India's fastest growing online real estate service provider,established in early 2012.
in a such short span of time By its working techniques and marketing strategies now PropertyMesh is one of the largest online real estate service provider in India. PropertyMesh emerges at a time when there are lots of other big brands are already present in the market with hundreds of other small competitors in market.But by their hard work, customer's satisfaction strategy bring them with the other successful competitors served from last multiple years.Now it becomes a challenge for others to stop the rapid growth of PropertyMesh. still propertymesh is running various promotional campaigns to attract more and more investors who want to invest in real estate sector for good returns.